Before you buy a Mattress, you should compare the basic ABC's of the Components of a Mattress and the ABC's of the Elements to buying a Mattress. No matter what mattress any person buys, each person will use their mattress 8 hours each day, . . each week, . . . each year - up to 20 years or more. It is one of your most important decisions about your Health, Sleep and Comfort. It’s a modern world, and that often means an overwhelming amount of choices. Here’s a quick guide to help you find your way to the mattress and pillow that’s right for you. Plush or firm? Latex, innerspring, memory foam, or air? The right answer for you is deeply personal and comfort is always subjective. For years, the rule-of-thumb was to get a firm mattress. However, body contours are not flat no matter whether you’re a back, side or stomach sleeper. Many conventional firm beds leave unsupported gaps between your body and the mattress. The body craves support when it needs rest and requires a sleep surface that conforms to those contours yet feels good. The best mattresses and pillows will keep your whole spine in alignment, from the tip of your toes to the top of your head. Supporting without stiffness, cradling without confining. How you sleep is important: Side sleepers need firmer pillows and support given a large space gap between the mattress and their ear and shoulder blade. However, the same sleeper may need a plusher mattress to support the hips and shoulders (and associated contours) which exert a lot of pressure on the mattress which could lead to more pressure points. If you sleep on your back, you may want to consider a medium firmness pillow to avoid the spine from improperly bending. To prevent back pain, stomach sleepers may need a lower profile or plusher pillow to ensure the neck and spine are in alignment. The key to selecting the right mattress for you is to not rush the process. Spend a few minutes lying down on several types of mattresses in your favorite sleep position. Pay attention to the position of your spine. Your body should feel completely relaxed in about 2 minutes. It’s uncomfortable to stay on a bed in a store for 2-3 minutes but it is critical to better understand the level of comfort and support the bed provides. The conforming nature of latex foam alleviates high pressure points that can cause tossing and turning at night, pain and stiffness the next morning. Latex is hypo-allergenic, contains anti-microbial properties, is dust-mite resistant and breathable. So, it can keep you warmer in the winter and cooler in the summer. Whether you are looking for a guest room mattress or one that you will be sleeping on every night for the next ten to fifteen years, purchase the best mattress you can afford. Latex foam can be more expensive than conventional innerspring mattresses because they are made of pure latex rubber— simply the best foam choice available today. But latex can last a lifetime so it may actually be more cost effective in the long run. Because latex foam mattresses never need flipping or turning, they are better for your back at night and during the day (as you don’t have to lift a 125+ pound mattress to keep its shape or to avoid body impressions). And latex foam pillows never need fluffing!! Mattresses and pillows made from Talatech® latex provide the perfect balance of comfort and support so you can enjoy deep, sound sleep night after night. Latex instantaneously conforms to the shape of your body, gently supporting and comforting you all night long, with up to 33% more pressure relief than other foam bedding. So you can awaken refreshed and rejuvenated to meet the challenges of the day—without the tossing and turning, without the pain and stiffness that disrupt a good night’s sleep—with restored energy and enthusiasm. Talalay latex eliminates pinches and pains that interrupt a good night’s sleep. It reduces high pressure areas that shut off capillary blood flow and cause a person to toss and turn. Latex pillows and mattresses alleviate pressure to bring oxygen and nutrients to muscles to provide a deeper, more restful sleep. Talalay latex provides up to 33% more pressure relief than conventional foam and fiber cushioning materials. Exceptional Durability – Latex is the most naturally durable cushioning material available. Derived from the tropical rubber tree, latex is highly resilient. Breathable – It is 4x more breathable than polyurethane, memory foam or Dunlop process latex. Uniquely Healthy – Talalay latex is ideal for allergy sufferers! It is naturally hypoallergenic, dust mite resistant and antimicrobial, inhibiting the growth of bacteria, mold and mildew. No artificial or synthetic materials have been added to provide these benefits. Surveys by The Better Sleep Council suggest that two thirds of Americans lose sleep due to stress. And one third lose at least a night per week of good sleep due to some form of insomnia. Latex foam can help keep you out of those statistics. Your body supports you all day. Support it all night with a latex mattress. Latex foam mattresses instantly conform to each unique contour of your body for exceptional, orthopedic support and pressure relief. They are even proven to provide 33% more pressure relief and contouring support than memory foam. Mattresses made with latex foam manufactured using the Talalay process are exceptionally durable and resilient. While they can cost more than conventional innerspring mattresses, latex will support you longer, more comfortably night after night for years to come. The gentle, conforming support of latex foam reduces high pressure areas (shown in red) that shut off capillary blood flow causing a person to toss and turn. This alleviates pressure and helps bring oxygen and nutrients to your muscles, so you awake feeling recharged and renewed. Latex instantaneously conforms to every curve and contour of your body to keep your spine in a properly supported throughout the night. We further enhance this natural feature by layering softer layers of latex near the surface to reduce pressure without sacrificing support. Latex mattresses offer you the ideal balance of comfort support. This unique, naturally derived material dynamicaly responds to your every curve and contour to provide outstanding, orthopedic support. It also alleviates sleep-disturbing areas of high pressure, so you sleep deeper and awake refreshed and ready for a new day. Mattresses made with latex foam manufactured using the Talalay process are exceptionally durable and resilient. While they can cost more than conventional innerspring mattresses, latex will support you longer, more comfortably night after night for years to come. Sleep is the most natural thing in the world. And you can sleep more soundly, more deeply on pillows of latex foam. Derived from the natural milk of the rubber tree, latex foam pillows conform to the delicate neck and head areas for superior support and comfort. Pillows made of Talalay latex foam gently cradle your neck and head, helping to keep your entire spine in a natural, relaxed alignment. Unlike fiber or down, latex foam pillows do not need to be bunched or fluffed to create a comfortable and supportive shape. Highly resilient, they will not break down, flatten, bunch or sag. And the Talalay process, used to manufacture the world’s highest quality latex foam, creates the most resilient, durable and comfortable pillows available. More Pressure Relief, More Comfort. Naturally provides up to 31% more pressure relief than “memory foam” pillows. Our RejuveNite pillows, made with Talalay latex, offers up to 97% more pressure relief than leading contour pillows. Eliminates stiffness and pain caused by inadequate support of cervical vertebrae. Choosing the right latex pillow will increase the comfort of your mattress for full body support. Uniquely Healthy – Ideal for Allergy Sufferers. Send us an email at consumersupport@latexintl.com or call 1.800.LATEX.US ext. 361, and we will put you in touch with the bedding experts who can help you choose the right latex foam mattress for you. Latex International (LI) is the only latex foam manufacturer in North America that transforms the milk of the rubber tree into the world’s finest latex foam. We are the supplier of choice for leading mattress and pillow companies around the world. Our exclusive, high tech manufacturing process and over 30 years of experience has set the world quality standard with Talatech® brand latex. Our Talatech latex is the most consistent and durable in the world : a competitive advantage for our customers around the globe; a quality difference consumers feel where it matters most – on the retail floor. And, in addition to leading edge Talatech® latex, we also offer the world’s finest Dunlop process latex or Unilatex™ which is ideally suited for base support cores under our plush Talatech latex. With all of our premium quality products and extensive services we have proven to deliver successful retail bedding programs for industry leaders. Please refer to our FAQs to find out why all latex is not alike, how does Talatech® compare to imported latex, and what sets LI apart from the competition. What Sets Us Apart? Quality Process, the LI Difference. What makes our products so special? Our commitment to perfection: from the mixing of raw materials to final product testing and assembly. Our entire manufacturing facility features the latest technologies and molding systems that help create the most consistent and superior sleep products. Our mattresses and pillows are manufactured in a unique eco-friendly process called Talalay: six steps that produce the most consistent and durable latex foam in the world. Every step of the process - from compounding to quality testing - is carefully monitored to assure out latex foam is the finest available. No harmful byproducts are released and every product we make is cleansed in an exclusive five stage fresh water washer to ensure the removal of residual latex proteins and curing agents. Be sure you look for the Talalay latex made in the U.S.A. to be sure you are purchasing the finest quality latex in the world. What is the difference between Talalay latex and Dunlop process latex? Why do you sell Unilatex™, which is manufactured by Sapsa? How does Talatech® compare to imported latex? What sets Latex International apart from the competition? Why should I do business with you? How can I find your products? How is latex different from memory foam? Why should I buy your products instead of less expensive foreign products? What is the difference between 100% natural and blended latex? Are latex allergies an issue in bedding products? Can latex work with traditional innerspring mattresses? Why is maintaining proper spinal alignment important? What are the differences between pillows? Is tossing and turning bad? How do I know if I’m not getting quality rest? I’ve tried everything, but I’m still not sleeping well, what should I do? Help! I can’t figure out the differences between mattresses! Latex International features the Talalay process: a highly controlled, sophisticated latex manufacturing process that produces the highest quality, most consistent latex available in the world. An alternative technology, known as the Dunlop process, is the most commonly used production method globally. It creates a firmer product that is most often used as a base core component. The major difference between the two processes is what happens in the mold just prior to the initial latex curing stage. In the Talaly process, only a small amount of latex compound is poured into the mold. Air is extracted to perfectly distribute the foamed liquid inside the mold and to create a consistent round, open cell structure. The mattress core is flash frozen to lock the cell structure in place and to prevent the particles from settling. In the Dunlop process, the molds are filled to the rim, air is not extracted, and there is no freeze stage. Therefore, the latex cell structure is less “airy”. Gravity takes over settling the particles to create a more dense product than Talalay latex. Talalay latex is available in a much wider firmness range so it can provide enchanced comfort choice for consumers around the globe. In 1997, Latex International entered into an agreement with Sapsa Bedding to be the exclusive distributor of continuous process (Unilatex™) latex cores in North America. This ensured a comprehensive latex product portfolio. Today, Latex International remains the only Talalay latex foam manufacturer in the Americas. Sapsa’s Unilatex™, made to our specifications and high standards, is the highest quality, most consistent Dunlop process product in the world. The product is a firmer, denser latex and is ideally used as a base core. We recommend 2 to 4” of LI’s Talatech® latex on top of the Sapsa material to optimize comfort, support, and pressure relief. What sets Latex International apart from the competition? The highest quality, most consistent and durable latex in the world—a critical building block for a successful program—domestically manufactured Talatech® brand latex. Exclusive and innovative products featuring a full range of technologies (Talalay and Dunlop process latex, visco-elastic and polyurethane). Finished designs delivered to your factory for final mattress assembly and upholstering. Marketing and point of purchase (POP) merchandising support. Latex International performs very stringent durability testing to compare its latex to competitive materials. The following two tests illustrate our superiority to imported Talalay, Dunlop process, and 100% natural latex. Compression Set Test: This test simulates the effect of body impressions on the latex after a person lies on the bed for extended periods of time. Latex mattress samples are clamped to 50% of their original thickness for 22 hours at 158 ° F. When removed, the percent loss in thickness is measured. Higher values indicate a higher propensity for the product to take a body impression over time. LI’s Talatech® latex consistently outperforms imported latex. Impact Test: This test is used to simulate the effect on the latex when a person continuously gets on and off the bed over extended periods of time. A block of latex is tested for ILD (firmness) and then placed in a testing machine where a weight is dropped on the latex repeatedly for 24 hours. The product is then removed from the machine and allowed to recover for 24 hours. ILD is again measured and recorded. Higher loss values indicate a higher propensity for the material to soften over time due to mechanical breakdown of the product. LI latex consistently recovers better, with less loss. Our mattress components and pillows are featured in the leading name brands at major sleep shops, department stores, furniture stores, bedding and home textile retailers across the country and around the world. For more Retailer Information visit Product Finder. By definition, latex is a rubber particle suspended in water. There are 2 types; NR or natural rubber latex and SBR (styrene butadiene rubber) or man made latex. All latex is either a blend of the two or 100% natural latex. All mattress components and pillows from Latex International are 100% latex. We use a proprietary blend of natural and man made latex to provide the optimal balance of comfort and durability. Natural rubber latex is used for durability. It inhibits tearing as it can be stretched like a rubber band. Man made latex (SBR) helps in creating a product that is very resilient to body sets as it can be compressed over and over and will continue to provide showroom feel. Wear and tear simulation testing shows blend superiority. 100% natural latex cores experience 5 to10% more mattress core height loss (i.e. body impressions) due to wear and tear than our Talalay and 2 to 3 times more loss (softening) due to repeated sitting and sleeping. All foams are not created equal. To be assured you are buying the finest in the world, ask for the only Talalay latex made in the U.S.A. – Talatech® in the brands mentioned on our retail link page. LI’s formulation and process controls help determine the level of consistencyand durability in a latex product. Our manufacturing process helps make the most consistent and durable latex in the world. Choice of Comfort: Our pillows come in three firmness ranges to provide exceptional support and pressure relief for back, side or stomach sleepers. Ultra durable: consistent cell structure means our latex provides superior comfort far longer than competitive products. Proven Quality: we are the only manufacturer to test EVERY mattress core in 9 locations to ensure product consistency. Every latex pillow is hand inspected and weighed. Clean and Fresh: EVERY mattress core and pillow is washed in a unique 5 stage washing process that removes residual soaps and proteins (the leading cause of premature softening). World Leader: Talatech® is the only latex made in the U.S.A—the finest in the world—for uniform product feel from top to bottom. Latex foam is proven to provide 31% more pressure relief and contouring support than memory foam. And it responds instantly to your unique body contours—without waiting for body heat. Latex is made from a rubber-based product versus memory or viscoelastic foam which is derived from plastics. Latex provides “instantaneous recovery” as it contours and supports any body movement, while memory foam provides “slow recovery”. With memory foam, the sleeper must wait for their body temperature to soften the foam prior to getting that true contouring support that they would experience immediately with latex. XSENSOR® pressure tests prove our Talatech® latex provides up to 30% more pressure relief than visco-elastic foam and outperforms other latex brands. Talatech® latex offers the superior support and pressure relief consumers are looking for today. And latex instantly conforms to every curve and contour. 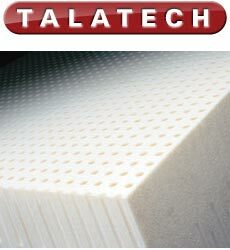 Talatech® latex is the finest latex foam available in the world. Our exclusive Talalay process ensures removal of proteins that can cause other latex to break down over time. It’s made exclusively in the U.S.A., more durable and more cost effective in the long run than imports. By definition, latex is a rubber particle suspended in water. There are 2 types of latex; natural rubber latex and styrene butadiene rubber or man made latex. All latex is either a blend of the two or 100% natural latex. All mattress components and pillows from Latex International are 100% latex. Latex International uses a proprietary blend of natural and man made latex to provide the optimal balance of comfort and durability. Natural rubber latex is for durability. Natural inhibits tearing as it can be stretched like a rubber band. Man made latex helps in creating a product that is resistant to sagging or taking body impressions as it can be compressed over and over and will continue to provide the same feel experienced on the retail floor for years to come. 100% natural latex sleep products are less durable than a blended latex product and are more likely to take a body impression over time. In the late 1990’s, latex allergies became a topic of concern. Publicity revolved around a very small portion of the public exposed to a protein found in natural rubber latex that caused allergic reactions. The majority of these cases involved health-care workers who came in frequent contact with medical products made using a dipped vulcanization product, often produced in third world countries that do not have the stringent GMP manufacturing codes employed in the United States. Although the process is completely different from ours, Latex International takes action to prevent the potential for allergic reaction. Non-skin contact products, such as mattresses and pillows, that may contain some natural rubber latex, undergo a five stage washing process which removes reaction-causing proteins while enhancing the over quality of the product. The openness of Talalay latex foam cells, allows for thorough washing. Complaints for allergic reactions to natural rubber latex are monitored by the FDA. To our knowledge, there has never been a single complaint over our more than 28 years of experience stemming from the natural rubber found in our mattresses and pillows. Our products have been tested by outside facilities and are shown to be inherently hypoallergenic for sufferers of mold, mildew or bacterial allergies. In addition, our mattress and pillows are resistant to dust mites and are naturally resistant to mold and mildew which are contributors to asthma and pulmonary function allergies. For complete White Paper details, click here. Latex comfort layers can be found in many high quality innerspring mattresses. Adding this extra layer of latex can improve the pressure relieving qualities and durability of virtually any mattress. Many mattress retailers will have “mini-mattress” cutaways that allow you to see exactly what is inside the mattress. Without proper support, your back, hips and shoulders are thrown out of alignment and you may wake feeling stiff, achy and tired. Latex foam provides comfortable support that keeps you in alignment, and conforms to your contours, cradling your body all night so you can awaken refreshed. Luxury, comfort or therapeutic support? The choice is up to you. Latex International offers its Classic pillow in a Plush, Medium and Firm comfort level to accommodate any sleep style. Innovative technology now allows us to encase latex foam with other silky fibers that offer a down like feel with hypo-allergenic qualities. Zoned pillows give you up to 33% more pressure relief than conventional contour pillows. And you can enjoy therapeutic support with sculpted contour latex pillows that feature an ergonomic shape. Tossing and turning reduces blood flow which limits oxygen to the muscles and tissues. The body compensates by moving. Unfortunately, this results in less restful sleep, which in the long run can cause you to feel run down. It’s so easy to get the proper support: latex mattresses and pillows let you, and your cells, recharge and renew. Your body will stay in REM or deeper sleep longer. Conventional wisdom says 8 hours a night, but children need more, and often, as we age, we seem to sleep less. The best guide to how much sleep you need is your own health. Many people sleep better with the simple addition of a comforting sleep routine, physical exercise and stress relieving practices. If you need an alarm clock or wake feeling anything but refreshed, you’re probably not getting the real rest you need. Pressure interrupts blood flow and oxygen to your extremities, causing the tossing and turning that interrupt a good night sleep. Proper support and alignment ensures your body gets vital nutrients to repair and restore itself all night long. Nutrition, lifestyle and other factors deeply affect sleep. Many people suffer from sleeping disorders that can only be addressed by a professional, so talk with your physician when rest isn’t improved by good sleeping habits and quality bedding. One of the most comforting things about latex for many consumers is the ease of purchase. Without innerspring and coil counts to consider, you can let the superior comfort and the supportive feel of latex foam cradle you for life. Confused about memory foam vs. latex? Remember this: latex foam provides up to 33% more pressure relief than other foam bedding, and that means better sleep. We make a mattress for you while you are in our store. We even will make you a test-sample mattress for you to take home and try. The trouble with buying a mattress is that you have to sleep on it first to see if you really like it. All mattresses feel pretty good when you try them. The trick, though, is how you feel when you wake up, . . . after 8 hours. You don't want to wake up with any pain you didn't go to bed with. 1. Support your posture as if you were "standing at attention" while you were lying done. Too little support and your rear end will sink too far into the mattress - leading to an unhealth curvature of your lower back. After 8 hours, a week, a month . . . this can lead to chronic back pain. 2. A mattress has to be comfortable and cushion you body and offer superior pressure relieving properties. Most mattresses make people toss and turn every 15 minutes - leading to a non-restful night's sleep. A mattress has to keep pressure off your body; and keep you from losing circulation; and keeping parts of your body from falling asleep. We are sleep experts. Our secret formula for success is genuinely helping you find the most comfortable and supportable mattress for your Health, Sleep and Comfort Needs. We listen to what you like. We try to find you the ideal mattress for both your Health and Comfort. Sometimes we have to sacrifice your Comfort for the more important factor, your Health . . . How you feel when you wake up. We invite you to bring us your Back, Bone, Nerve, Muscle and Circulatory Problems. We offer Innerspring, Latex Foam, Air, Memory Foam and 100% Natural Organic Mattresses.